Proudly sponsored by the Renmark Club, the Dash 4 Cash race is Round 1 of the Club’s Championship Series. Sprint speed racing around a designated course, two boats at a time, time trails over two laps. Boat motor sizes range from 15HP, 25HP, 30HP Standards, 30HP Super Standards, 300cc Modified, Rookies and 30HP Sports. Boats are grided per the previous year’s Championship Points System. Grid positions are interchanged between laps. An excellent race to view from the banks of the Murray River at Renmark, South Australia. 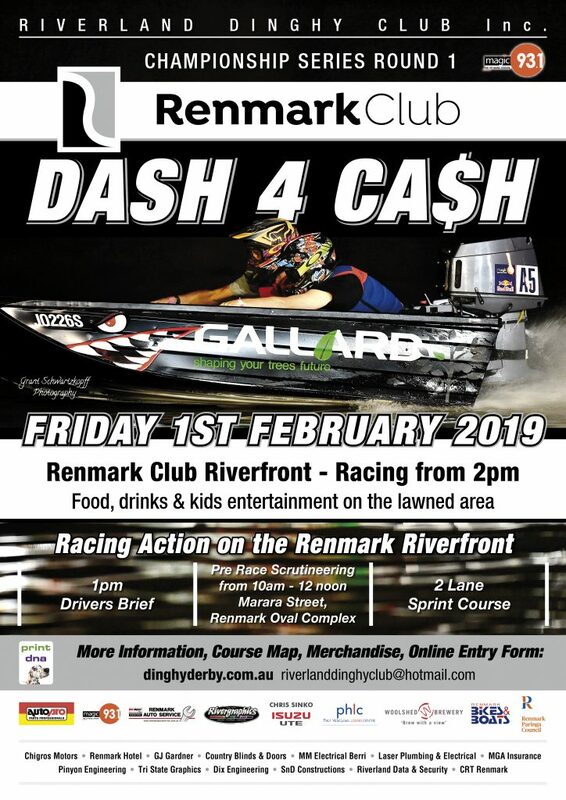 The Renmark Club Dash 4 Cash will be conducted on the water directly in front to the Renmark Club on Friday 1st February. The Dash 4 Cash in an ideal event for family viewing with the added bonus of no entry fees. Please come along and view the event on the spacious lawned areas, surrounding the club. Remember to bring your chairs or blankets. Service Clubs and fast food outlets will in operation throughout the night. A wide range of food and drinks will be on sale. The Club also host a VIP night, please contact the club for booking details. Along with the thrills and spills of racing a bouncy castle will be provided free of charge courtesy of the Riverland Dinghy Club. Racing will commence at 2pm noon commencing with the 15HP and finishes with the final race around 9:30pm. Closed waters restrictions will be in place immediately upstream and downstream of the event from 8am to 11pm.